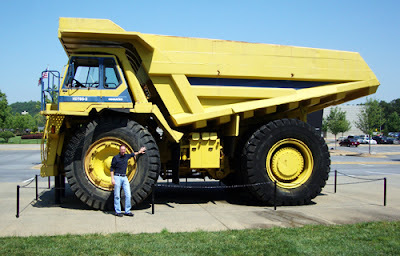 One of my absolute favorite artifacts at the Tellus Science Museum in Cartersville, Georgia, is the biggest "Tonka Truck" I've ever seen. How big is it? That's me standing next to the driver's side tire in this photo...this truck is huge! The marvels inside Tellus are also absolutely fascinating...and I still find myself laughing when I recall the humor incorporated into such a serious disciplines. I'm very impressed that someone out there has the talent to so beautifully and elegantly present the geological, transportation, and archeological sciences (to name a few) and sneak in sneak in a "funny" here and there--like the Einstein Bobblehead in the Periodic Table of Elements display. Just for the record, and so I don't get into trouble, the truck in this photo is not a "Tonka" truck--although I'm sure there are lots of kids who would argue, including guys my own age who also played with Tonka Trucks. It's actually a Komatsu truck, so "Thank you Komatsu for bringing back wonderful childhood memories! And Tellus, too!"